Jan 21, 2015 - TORRANCE, Calif.
A completely reengineered and redesigned Honda Pilot SUV will make its world debut at the 2015 Chicago Auto Show on February 12 at 9:30 a.m. The all-new, eight-passenger Pilot SUV – completely designed, developed and manufactured in America -- will raise the stakes in the mainstream three-row SUV segment with new technology, advanced safety, class-leading fuel economy and enhanced family utility and versatility. The new Pilot represents a dramatic shift in design, while showcasing new standout technologies, versatility, and dynamics currently unavailable in the mainstream SUV segment. Further, the Pilot remains as family-friendly as ever, proving once again that driving the family truckster can be a joy. The redesigned Pilot SUV, launching at Honda dealerships nationwide this summer, will further augment a Honda light truck lineup that includes the recently redesigned Honda CR-V – 2014 Motor Trend SUV of the Year and the best-selling SUV in America – and the all-new Honda HR-V crossover, launching this spring. 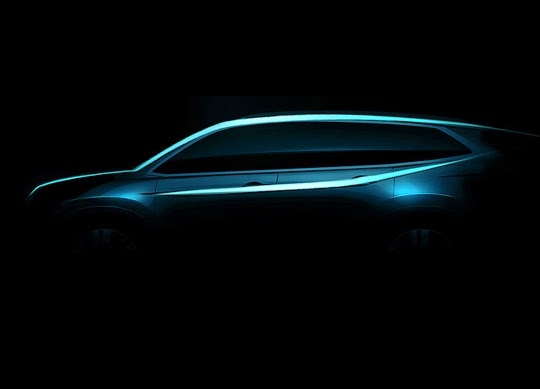 In addition to showcasing the completely redesigned Honda Pilot SUV, the company also will reveal details and styling direction for its forthcoming Ridgeline truck at the Chicago Auto Show. "Honda continues to fortify its light-truck lineup in 2015, this time turning our eye to the fast-growing family SUV segment," said Jeff Conrad, senior vice president and general manager of the Honda Division. "The new Pilot will raise the bar in a segment it helped to create, with more innovation, style, premium features and family utility than ever before." The original Honda Pilot was introduced in 2002 as the first mainstream eight-passenger SUV to feature car-like unitized body construction, delivering more refined driving dynamics, better fuel economy and superior cabin space in a family-oriented sport-utility vehicle. The second-generation Pilot was launched in 2008. All three generations of the Pilot have been designed and developed by Honda R&D Americas, Inc. in Los Angeles and Ohio. The Pilot and its engine are now produced at the company's Lincoln, Alabama plant. The Honda brand's U.S. light-truck sales were up 10.6% in the fourth quarter of 2014 to 154,480 SUVs, pickups and minivans, including an 8.6% gain for Pilot, to 28,610 units, in the fourth quarter.